Firefox is currently transitioning to a multiprocess architecture (e10s), which will give users a more stable and responsive browser. This transition affects certain add-ons, which must adapt to the new model or they won’t work correctly, and will be flagged as incompatible. We’re reaching out to add-on developers in various ways so they can check whether their add-ons are affected, and get support for updating their add-ons. Now, there’s a way for you to help as well with outreach efforts, and that is by reporting incompatible add-ons. Add-on Compatibility Reporter (ACR) enables you to tell us if an add-on works in a particular version of Firefox. Its reports have been a very useful tool for us in tracking incompatible add-ons and helping developers fix them. Add-on developers are also able to see reports sent for their add-ons in the developer tools. If you want to give it a try, we suggest that you do on one of the prerelease versions: Beta, Developer Edition, or Nightly. The latter two have multiprocess enabled for all add-ons by default, which is what we’re most interested in at the moment. The latest versions of ACR have integrated support for multiprocess Firefox. 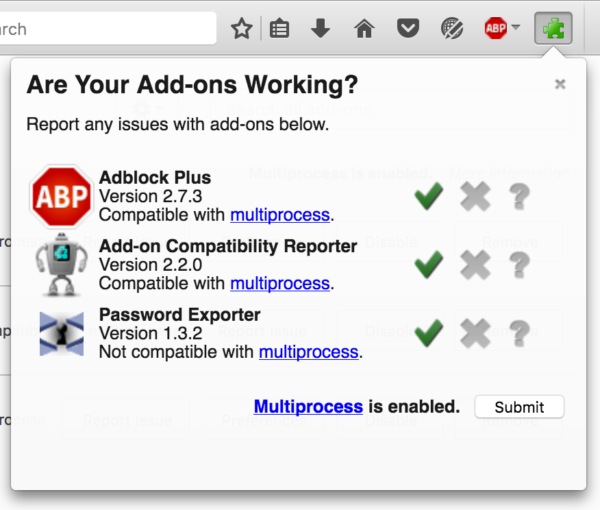 Once you install the add-on, you will see which of your add-ons have declared multiprocess compatibility. 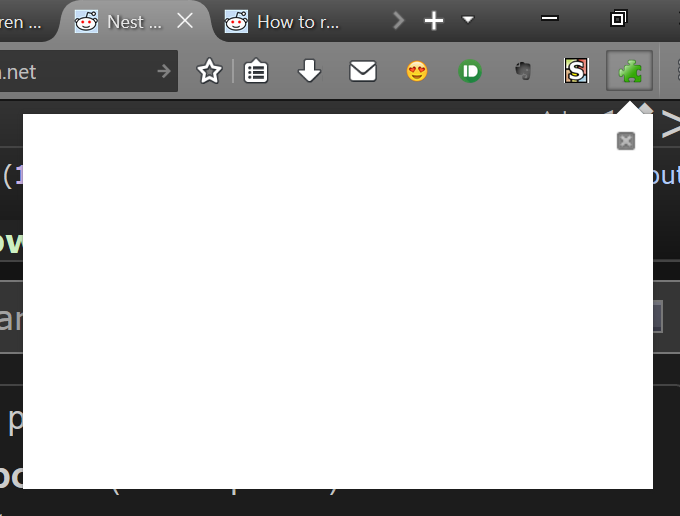 You will also see if your version of Firefox has multiprocess enabled. The icons let you report if an add-on works or not. You can also do all of this from the Add-ons Manager, if you prefer. To determine if an add-on is multiprocess compatible, ACR looks for a flag in the add-on manifest, set by the developer. So, for example, Password Exporter appears as not compatible, even though it works correctly with e10s on. I maintain Password Exporter and haven’t yet updated its manifest to reflect this (I will soon!). Knowing which add-ons are working with e10s is critical for a successful transition, so we hope you can help us by installing the Add-on Compatibility Reporter and letting us know which add-ons aren’t working for you. Will add on authors eventually be able to mark add ons as compatible without releasing a new version (in AMO)? I don’t feel like updating my add ons since they work just fine but they currently force e10s to be disabled. I don’t expect that to be implemented, so I suggest you update your add-ons, even if only to change their manifest. Looks like the issue is fixed now. Thanks.